Rawalpindi Development Authority (RDA) has prepared a plan for railway tunnel at Mareer Chowk and has already sent for the approval to the Works and Housing Department for approval. According to officials, the PC-I project will be completed at a cost of Rs 500 million and the project will be initiated, once the Works and Housing Department approves the plan. The 30-feet long tunnel will be constructed at the railways bridge for the traffic coming on the Benazir Road from the district courts side and Kashmir Road. The tunnel will help in a smooth flow of the traffic. 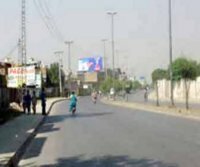 The officials of Rawalpindi Development Authority (RDA) are hopeful that the Works and Housing Department will allocate and release funds in the upcoming budget. Punjab Chief Minister, Mian Shahbaz Sharif has already given formal approval for construction of the tunnel at the given site. Therefore, the officials are hopeful that funds will be released soon. Travellers and passengers have to spend around 10 to 30 minutes to cross the signal during the peak hours but this time will be minimized now.